Exploration and mining activities are surrounded by a stringent regulatory framework, requiring a number of permits. After having identified an area of interest a company may apply for an exploration permit, securing the area and excluding competition for 7 years. It acknowledges the right to prospect for additional mineralized locations and to conduct exploration activities (drilling, sampling, geophysical measurements, etc). Also the use of motorized equipment is common at this stage, requiring a municipal permit. If volumes up to 2000 m3 ore are to be extracted for processing tests, a pilot extraction permit is needed. The exploration and pilot extraction permits are granted by the Directorate of Mining. 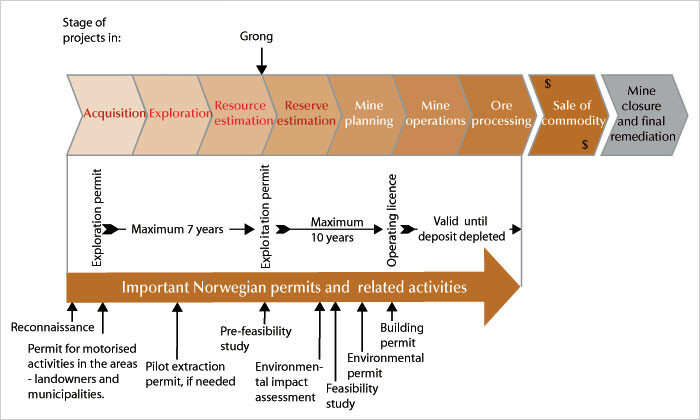 The next step is to apply for an exploitation permit, given that the collected information - with acceptable probability - shows, that an explored mineralization can be turned into a resource for mining. The application has to be turned in before the exploration permit lapses (7 years). An exploitation permit grants the company another ten years of exploration work. In this phase the compilation of a pre-feasibility (resource and reserve estimation) and a feasibility study (reserve estimation, a profitability study) are central parameters. These studies include mining and processing plans, an area regulation plan, an environmental assessment and a plan for remediation. The following step, based on the exploitation permit and the above mentioned plans is, to apply for an environmental permit with The Directorate for Climate and Pollution. Also, a building permit from the local municipality has to be applied for. All the above documentation and granted permits constitute the basis of the application for an operating licence with the Directorate of Mining. Having obtained an operating licence, a company can start the construction of a mine. A Norwegian operating license is granted with no time limit, but can according to the law be subject to revision every tenth year.